Autumn is the time dedicated to wine guides and Tenute Rubino is proud of the excellent ratings received in recognition of the company’s commitment to promoting the richness and quality of the Apulian wine region. Italy’s most distinguished wine guides confirm the value of a wine-making project focused on the respectful and innovative rediscovery of Puglia’s traditional wines. Once again, Susumaiello takes the spotlight: AIS (Associazione Italiana Sommelier) and Gambero Rosso have rated highly the wines obtained from this autochthonous variety native to the Brindisi area, saved from oblivion by Luigi Rubino’s company over twenty years ago. Today, by Luigi Rubino and oenologist Luca Petrelli, Susumaniello is a great versatile vine. 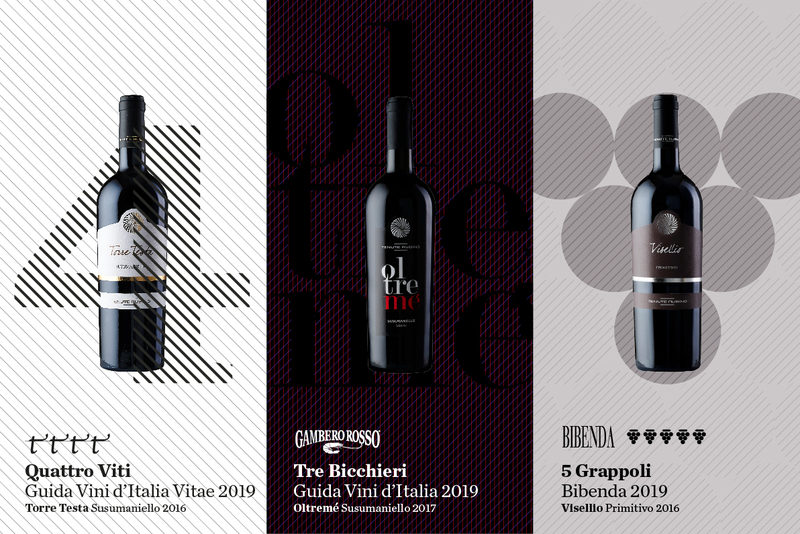 The Torre Testa 2016 cru is awarded Quattro Viti, the highest recognition given by the 2019 edition of Guida Vitae, published every year by AIS, while the Oltremé 2017 received Tre Bicchieri from the Gambero Rosso “Vini d’Italia 2019”. The flag bearer of Tenute Rubino’s Susumaniello based wines, Torre Testa is a territory-dedicated wine in which complexity and elegance find a perfect synthesis. Today, this label is considered one of Puglia’s top quality wines and its excellence is confirmed by the success enjoyed in the most demanding and exacting international markets. For the third consecutive year, however, Tenute Rubino’s wine Oltremé has climbed its way to the top of the Gambero Rosso wine guide, proof of how even the company’s more approachable wines possess enough personality to express the character of a variety that has found increasing favour among foreign buyers. Lively and surprising, Oltremé seduces the palate with its fruity notes, keeping all its pleasantness and elegance thanks to a shorter vinification process that preserves all the freshness of the grape. “The Susumaniello project – company owner Luigi Rubino explains – is constantly evolving. Twenty years ago, we embarked on a path which was difficult to communicate and explain. Today this native variety is appreciated for its versatility but also because of its important territorial identity “. The effort to recover and promote lesser known historical varieties (which also include Bianco d’Alessano, Minutolo and Ottavianello), is something that Tenute Rubino has always pursued while at the same time championing the region’s best known grapes such as Primitivo, popular with wine lovers all over the world. It is no coincidence, then, that the 2016 vintage of the cru Visellio has conquered the prestigious Cinque Grappoli in the 2019 Bibenda Guide, the highest recognition awarded by the Italian wine map published every year by FIS, the Italian Sommelier Foundation. A true champion of Apulian enology, Visellio is an intense and powerful Primitivo with great extractive power. Aged in barrique, it stands out for its great softness and lingering persistence. “We have created our own production style – Luigi Rubino concludes – which has won us the appreciation of both critics and the public, thanks to its clear and simple vision: revitalizing the Apulian wine tradition while also keeping up with the times, creating wines that are modern but also deeply rooted in a glorious past “.